This document is a technical summary of the Federal Highway Administration report Safety Evaluation of Protected Left-Turn Phasing and Leading Pedestrian Intervals on Pedestrian Safety (FHWA-HRT-18-044). Pedestrian safety is an important issue for the United States, with pedestrian fatalities representing approximately 16 percent of all traffic-related fatalities in 2016. (1) In recognition of the magnitude of this problem, the Federal Highway Administration (FHWA) funded a study to evaluate promising infrastructure improvements to increase pedestrian safety. 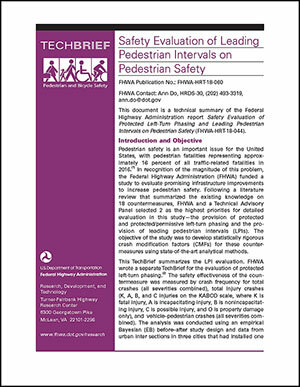 Following a literature review that summarized the existing knowledge on 18 countermeasures, FHWA and a Technical Advisory Panel selected 2 as the highest priorities for detailed evaluation in this study—the provision of protected and protected/permissive left-turn phasing and the provision of leading pedestrian intervals (LPIs). The objective of the study was to develop statistically rigorous crash modification factors (CMFs) for these countermeasures using state-of-the-art analytical methods. This TechBrief summarizes the LPI evaluation. FHWA wrote a separate TechBrief for the evaluation of protected left-turn phasing. (2) The safety effectiveness of the countermeasure was measured by crash frequency for total crashes (all severities combined), total injury crashes (K, A, B, and C injuries on the KABCO scale, where K is fatal injury, A is incapacitating injury, B is nonincapacitating injury, C is possible injury, and O is property damage only), and vehicle–pedestrian crashes (all severities combined). The analysis was conducted using an empirical Bayesian (EB) before–after study design and data from urban intersections in three cities that had installed one or both of the countermeasures of interest (Chicago, IL; New York City (NYC), NY; and Charlotte, NC). Increased visibility of crossing pedestrians. Reduced conflicts between pedestrians and vehicles. Increased likelihood of motorists yielding to pedestrians.